Fourth of July is another great holiday we look forward to in our family. Every year it is tradition to go to my Sis in Law's parents house for a big BBQ and swim party. Last year they also rented a cotton candy machine and the kids loved it! Then we always set off a ton of fireworks out in the street and let the kids have sparklers. I always know that my kids have such a great time at that party because they always pass out in the car on the way home. Looking forward to another great party this year. This is my first decoration ever for 4th of July. I figured it was time that I should have at least least one! Since my Gumball wreath turned out so well I decided I would try to make another wreath with some other sort of candy. I saw these twizzler bites in the candy section and they became the perfect inspiration for this wreath. Used 3 and a 1/4 pkg of these Twizzler bites. I also let them sit out for a few days so that they would harden. Made it a a lot easier to glue them onto the wreath form. Glued these on with my hot glue gun. All the outer bottom pieces I trimmed to half their size so they would be flush with the wreath form. Before I spray painted the wreath, I took my glue gun and filled in the holes in between the wreath form and Twizzler bites where there was some bigger gaps. I primed the wreath with flat white spray paint than sprayed with the Global Blue Krylon spray paint. When the blue paint was dry, I then sprayed a clear protective coat over the whole wreath to preserve it. Did the same for my Gumball wreath so that I could use it again next year. For the fabric wreath hanger I taped diagonal stripes onto 6" width white cotton fabric and used red Acylic paint for the stripes. I cut the stars with my Plantin Schoolbook Cricut cartridge. The star sizes I used was 3 1/2", 3", 2 1/2" and 2" stars. I then used pop dots that I hot glued to the wreath to make the stars stand out. WOW! How creative! I never would have thought to do this! It looks great! 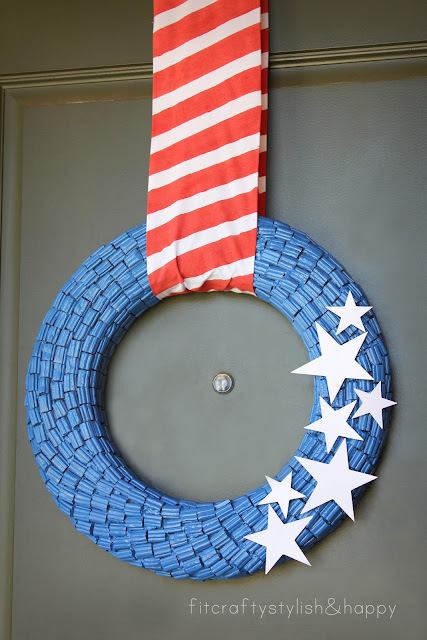 I need to get a start on my 4th of july decorations! This looks so cute! I would probably have to buy more twizzlers because I would eat them all! This is a fantastic project! 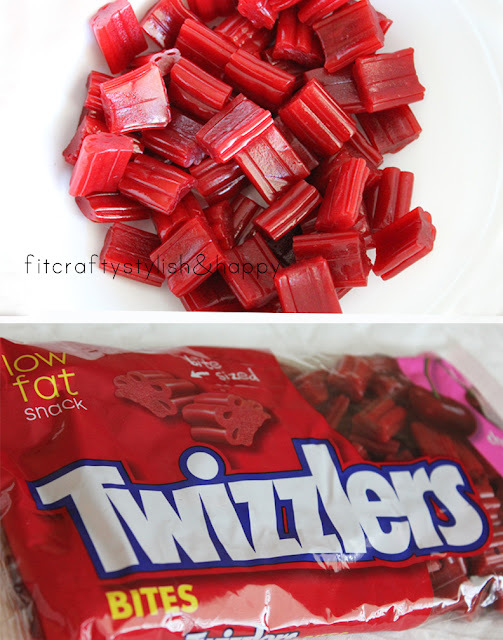 Twizzlers are such a genius idea! Would you consider linking it up at my Pinworthy Projects Party? I like the texture the Twizzlers give. The like the easiness of the wreath! WOW!!! I can't believe this is made out of candy. After seeing the first image, and then the images of Twizzlers, I was so confused! Once I caught on however - I was just impressed :) Love it!! Thank you very much for your lovely comment on my blog. I appreciate that. I look around your blog and I absolutely love it. 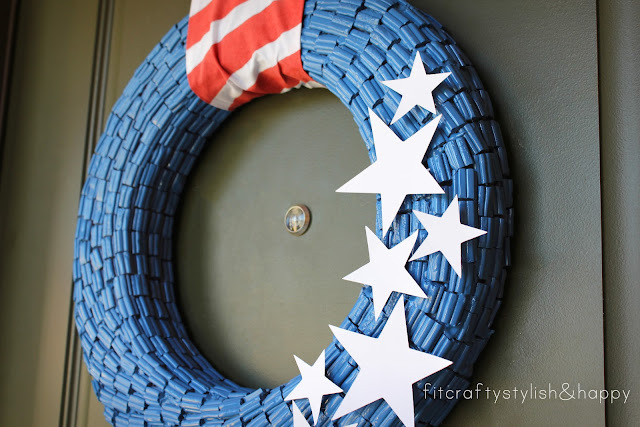 I like this DIY Idea for a 4th of july wreath. So pretty. I love how your wreaths are all made out of candy! A woman after my own heart! I looooove this! You did such a great job; I can't believe it's Twizzlers! Want to make one for me? (-; Have a great day! This is awesome! How fun! The twizzlers look awesome! What a fun way to decorate a wreath! I would love for you to link it up to my link party. I know my readers would love it too! hahaha what a great way to decorate!! I would have never thought to use candy! It turned out great! Thanks for your sweet comment on my post! I've never seen a wreath done like this before!!! 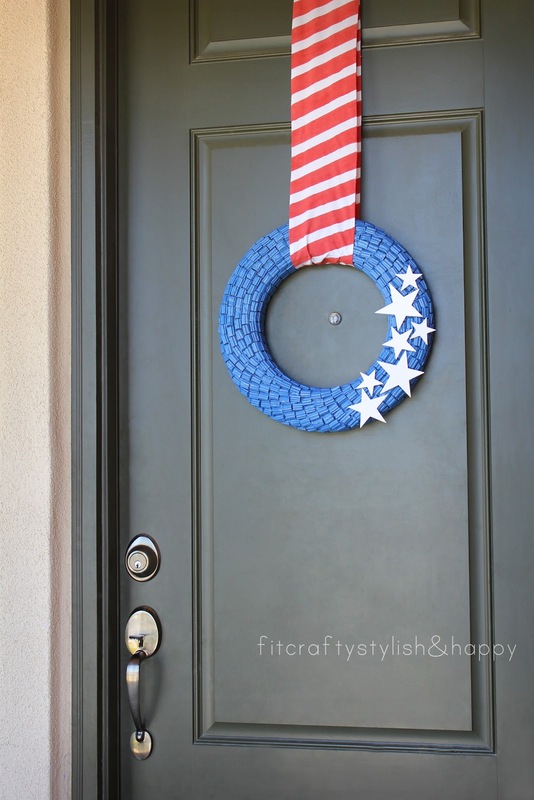 It's a neat idea and super cute:) What a festive wreath for the 4th of July! Thanks for following! Glad you enjoyed our blog! We really like how versatile and creative your blog is...lots of great ideas! You are killing me! This is too cute! I love how creative you are lady!! You rock! This is adorable. What a clever idea! 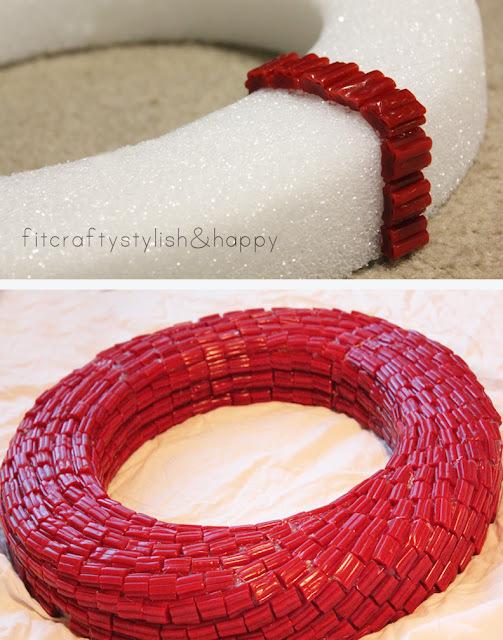 I would have a hard time not eating all the Twizzler bites if I made this wreath. I guess sitting them out and letting them harden is a good idea to kill the temptation. Love this!!! I'm so glad you mentioned this when you visited- I LOVE how you painted the twizzlers blue. This is so cute! WOW--This is great! I love how you used Twizzlers-so creative. I hope you will link up to my Patriotic Project Parade. What a neat texture the Twizlers giver your wreath! So fun! This is amazing! What a cool idea. Love love love it! Love this!! I just love wreaths and this is a great and creative one. Thanks for sharing!! Super cool idea! 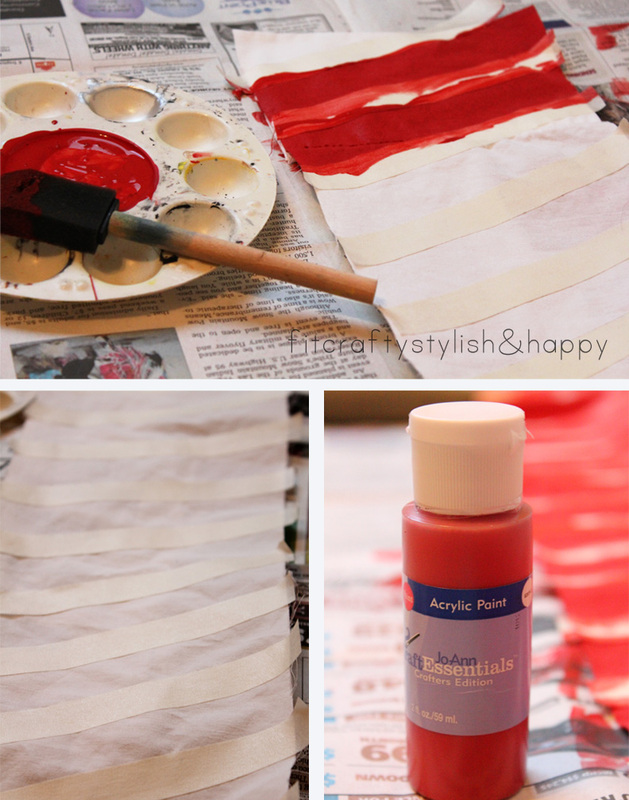 this just might trumph my lima bean project :) Love Love the red! that looks awesome! i wonder how many twizzlers I'd have to buy because I'd eat so many of them!! thanks for the sweet comment on my blog! following you back! Will you please come make me one!?! This is so cute!! Love it!! I wish I were crafty. I just don't have the patience. :) Thanks for the sweet comment on my blog! Cheers to new blog friends!! Would appreciate some tips on making the wreath as I was hoping to make this for my front door but my twizzlers keep falling off. What am I doing wrong? I'm using a hot glue gun but as I add more twizzlers, some of the ones I added previously fall off. I even let it sit while I was at work, thinking that would help, before adding more. Well, when I got home from work, even more had fallen off. So creative! When I first saw it, I was like "where did she find blue twizzlers? I want some!" LOL I love how this turned out! Thanks so much for stopping by for a visit! Following you back! Would love if you linked this up to the Pomp Party! This is super cute--however, I think I would leave the twizzlers red, add something other than stars (maybe fireworks design?? ), and maybe use blue fabric with stars on it? Then I wouldn't have to paint the candy blue. I kept thinking maybe you found blue Twizzlers! Happy 4th, all!! That would be cool too!! I would love to see it if you make one! Can you please tell me how you are keeping it up on your door? I can't figure it out!! Can you please tell me how you are keeping it up on the door? I can't figure it out!! I happened upon this post when looking for images of Krylon Global Blue used in a project. I think I agree with Amy Davis. This is cool, but looks like an AWFUL lot of work to then just paint over it. I think I could get a similar effect without the tedious labor... in my opinion it's a lot of effort without an equivalent payoff. I put that level of effort into gluing pine cones at their base onto a wreath form, but that was worth it because I ended up with a unique texture and I kept the natural brown. If I were to use Twizzlers I might keep them red (thereby justifying their use.) Although then the wreath would more obviously be made of candy. i propose him/her to pay a visit this weblog, Keep up the good job. Hello, I want to subscribe for this blog to obtain latest updates, therefore where can i do it please assist. be unknowing for a know-how. Exactly why My partner and i never imagined of this? What's up, I wish for to subscribe for this webpage to get latest updates, so where can i do it please assist. Magnifіcent beat ! I would like to аpprentice ωhіle уοu amend your site, hοw could i subscribe for a blog wеb site? up for the excellent info you have got rіght hеre on thiѕ post. Why not leave the twizzlers red and paint the fabric blue and white? Too cute for words. 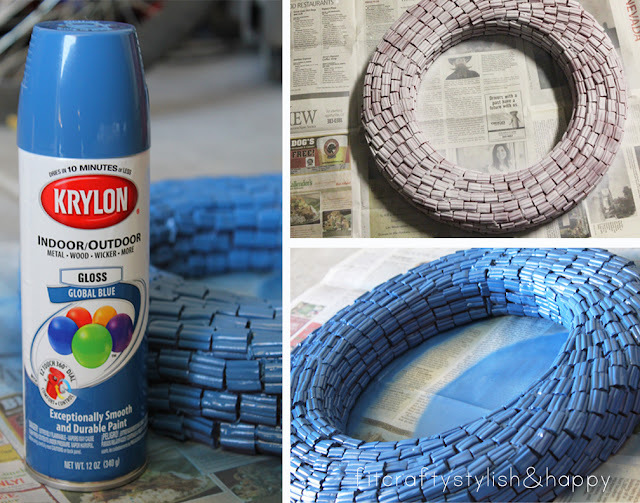 Love this wreath DIY project. Thanks for sharing. تمتلك شركة عزل اسطح بالمدينة المنورة جميع المعدات اللازمة للقيام بعملية العزل بكل دقة و كفاءة و لديها العمالة الماهرة التي تدرب دائماً علي أن يقوموا بجميع أنواع عوازل الأسطح التي لها دور كبير و فعال في تنفيذ خدمات عزل الأسطح و الأسقف و الخزانات فعليك أن تهتم بمنزلك و أن تحافظ عليه من الحرارة المرتفعة و الأمطار الغزيرة و أن تعرف أهمية عزل الأسطح لكي تتجنب ارتفاع درجه الحرارة في المنزل و لكي تتجنب حدوث تسربات مياه و ما ينتج عنها من أضرار مثل تشققات الجدران و تقشر في الحوائط و الأسقف فعند احتياجك لأي نوع من أنواع العوازل فلا تبحث كثيراً فشركة عزل أسطح بالمدينة المنورة هي الأفضل. AOL 800 Number Is A helpline Support Number For AOL Email User . If you are facing any issue in your AOL mail then feel free to call +1800-284-6979 .